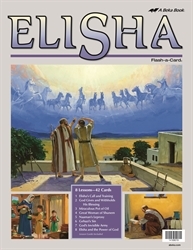 Display the truths of Old Testament stories through these brightly colored Flash-a-Cards. Tell the story of Elisha from taking up the mantle of Elijah to Elisha’s death. Capture the attention of your child with 8 lessons and 42 picture cards. A detailed teacher guide gives you content to teach, prompts to use the pictures, and review questions for each lesson. 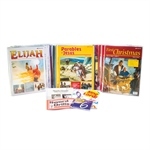 Expose your child to the doctrinal truths and applications within the story of Elisha.